Jurassic Attack is back this weekend at the 8th Annual “Carnage in Coaldale” Smash and Splash Demolition Derby and Mud Bog at its new location. Come take a ride and experience the ultimate in monster truck mayhem, as Jurassic Attack dinosaur-themed monster truck rides are once again one of the family fun-filled feature attractions. 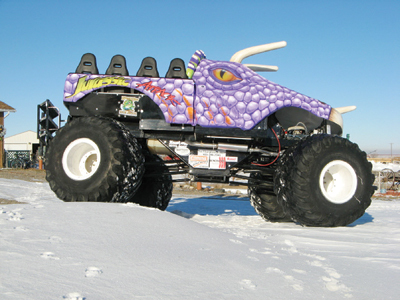 Don Frankish, owner and builder of Jurassic Attack, raced monster trucks full-time for close to 25 years. Basically, Frankish explained, the rides give participants a chance to ride in what is built to be very similar to a race version of a monster truck. “It has the rear steering, so it gives you that weird sense of how they corner and how they behave. Usually, we’ll have different little obstacles to climb over. It sounds like they’re going to have quite a few humps and hills for us with the new location this year,” he noted. “We pretty much go from May long weekend until about the end of October doing motorsports events, fairs, air shows — that kind of thing,” he said. Originally in the 1980s, Frankish said, he and his team were heavily involved with truck and tractor pull sports and that evolved into monster trucks, as a part-time gig. “That started about 1990. We did it just for fun for about 10 years and then we evolved into a two-truck race team from there and were pretty much full-time for about 15 years of strictly racing — about 40 weekends out of the year,” he said. According to Frankish, the race end just wasn’t profitable anymore with a lot to do with the way the Canadian dollar went and a lot to do with the way the sport went. “It became more about entertaining than racing. With that, came more destruction. Eventually, we just decided it couldn’t be done from Canada anymore,” Frankish pointed out. At the time, Frankish said, he and his team were at work building a ride truck and nowadays it’s something he and his team can keep busy at probably six months out of the year full-time. “And makes about the same money as the race trucks without near the parts bill at the end of the day,” he joked. Frankish resides just outside of Lethbridge off of Broxburn Road. Smash and Splash kicks off Saturday with the demolition derby at 1 p.m. and Sunday with the mud bog at 11 a.m. The new location is north of Coaldale on 8 Street, north of the Coaldale Inn. Admission at the gate is $10. Children 12 and under are free. The additional cost for the Jurassic Park monster truck ride is $10 per ride. “Come on out to the event and have a good time,” Frankish added.